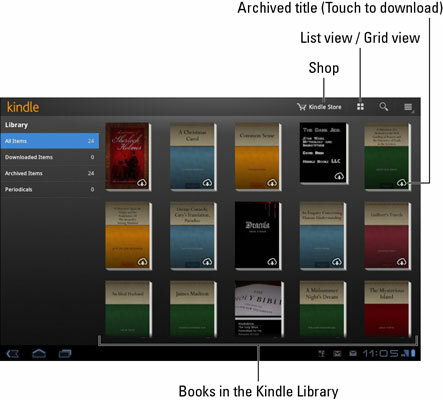 You can pick up a copy of the Kindle app for your Samsung Galaxy Tab free at the Android Market. The first time you start the Kindle app, you may be asked to register or sign in to your Amazon account. Do so. By signing in, you can instantly coordinate your Kindle eBook library with any previous purchases you may have made. The Kindle app’s main interface shows a scrolling list of your eBook library, plus it gives you quick access to the Kindle Store to buy even more books. Start the Kindle app on your Galaxy Tab. Touch the Kindle Store button. You see the Amazon Kindle Store. There are recommended books, categories to browse, plus lists — including lists of the top paid and free titles. It’s just like a bookstore, but you can shop in your pajamas. Well, you can shop in your pajamas at a real-world bookstore as well, but no one notices when you do so at the Kindle Store. Search for the book you want or browse the categories. As a suggestion, choose the category Free Popular Classics to find something free to download. Touch to select a title. Free titles have $0.00 listed as their price; otherwise, you see the book’s cost displayed. If you’re timid about paying for an eBook, choose the Try a Sample button instead. A snippet from the book is downloaded, which you can peruse at your leisure at no charge. Yes, it still says “Buy” even when the title is free. After touching the Buy button, the title is downloaded (transferred from the Kindle Store over the Internet and into your Galaxy Tab). Touch the Read Now button to read your new book, or keep shopping. You may be prompted to log in to your Amazon account again after touching the Buy button (Step 5). Do so. You may also be prompted to enter or choose a credit card if you don’t have one automatically set up for your Amazon account. That’s normal, and it’s perfectly safe. You receive an e-mail confirmation message describing your purchase. The e-mail appears even when you “buy” a free eBook. After choosing a book in the Kindle app, you see it open on the touchscreen. The first time you open a book, you see the first page. Otherwise, you see the page you were last reading. You can touch the left or right sides of the screen to flip a page left or right, respectively. You can also swipe the pages left or right. You can drag the progress meter at the bottom of the screen to skim back and forth through the book. 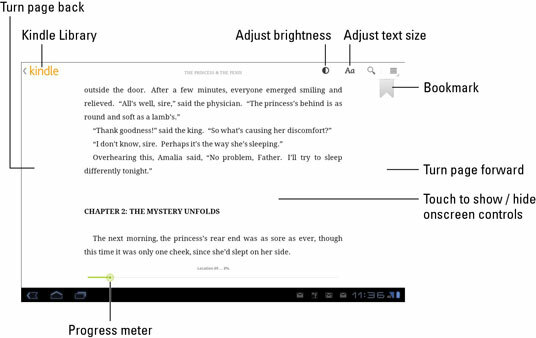 Or, for more precise movement in an eBook, touch the Menu icon button and choose the Go To command. Long-pressing text selects the text on the screen, similar to selecting any text on the Galaxy Tab. A menu appears atop the screen when you’ve selected text. You can make a note for that chunk of text, highlight it, or search for text elsewhere in the same book or on Wikipedia or Google.